AncientBead.com welcomes you - Genuine old and ancient beads! Ancient Beads can be thousands of years old and reach back to the cradle of civilization! What fascinates me deeply is that Beads are the oldest art form in the world! They are older than the cave paintings. Most probably you will feel a significant difference between wearing ancient beads, full of history, and new factory made. Just imagine the feeling of wearing an old bead, that has been in use for more than 30 generations. You are yourself a bead on a long string of human DNA from your ancestors. They still live in you right down to the sea anemone that genetically seen gave us our heartbeat. So tell me. Can we be the owners of ancient beads or are we just caretakers? For the sensitive person, an ancient bead is charged with the atmosphere of those ancient cultures that made and used them. This symbolic energy allows the wearer of the bead to be in remembrance of his own archaic human history. This bond links to the real in you. It shows a pathway either out of the hamster wheel of modern civilization or a maybe more; a way to navigate the accelerating complexity of big data in a fluid and interconnected world society. In ancient times, before clothes were designed with pockets, beads were used as a kind of currency and a sign of social status. However, I dare to say that these beautifully crafted beads were primarily used for ritualistic and religious purposes. They were talismans. Ancient beads were focal points of mystical power in a world of analog, symbolic and metaphorical self-understanding and social navigation. In my perspective, an ancient bead still can be a talisman, not exactly in the way it was used in ancient times, but in a new setting that I would term as postmodern magic. For the modern man, everything is seemingly governed by reason. Large parts of our brain are however still rooted in archaic symbolic thinking. In recognizing that we are both logic and symbolic thinking systems, we can in a kind of post-modern double code both wear an ancient talisman and a perfect suit and tie. In this sense, we charge the talisman, the ancient bead, with our symbolic and deeply emotional rooted intentions and wishes. Through the talisman, we are now able to make a great synthesis between our irrational emotional and our need for intelligent navigations systems. 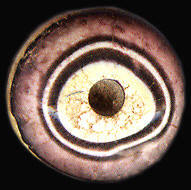 To see Ancient Beads in the light of post-modern double coded 'magick'. Most of the old beads were sourced from Nepal, but even in my native country Denmark I had the good fortune to hunt down some of the best beads in this collection! Also, my father as a sailor in the East has in the late 50ties collected many of the beads you see here. The major part of these remarkable ancient and old beads have come into this gallery from the India of antiquity, covering Nepal, Pakistan, Afghanistan, and Tibet. This 'Greater' India was a pioneer in stone bead making and began exporting lapis lazuli and carnelian beads from as early as 2000 BC. Hence the majority of the beads in this collection are from the Indus Valley Civilization up to 1000 AD. Feel free to browse through this virtual catalog of genuine old and ancient beads. ANCIENT AND OLD BEADS FOR SALE! I have been a passionate collector of beads for more than 30 years. However, I have now decided to sell parts of my collection. Feel free to enquire about prices! Kind regards from Gunnar Muhlman! May the bead-force be with you! As long as there have been collectors of ancient beads there have been a production of fake beads. However, in the last few years, a virtual tsunami of fake beads has entered the market! This vertical rise in look-alikes is due to the almost exponential rise of Asian collectors, especially from mainland China. The growing demand for ancient beads has virtually hoovered up the market and this to such an extent that there are only a very few genuine ancient quality beads left for sale. Real ancient beads are no more to be found in the countries that ten ago still had plenty of them. 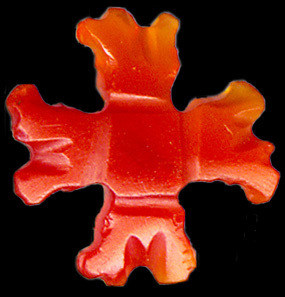 The sources have simultaneously almost dried up, and only low-quality beads seem now to be available. However, there is no sign of any lack of beads in the seller's shops in Asia or on the internet. When one takes a look at the ancient bead market nowadays, there is one string after the other of absolutely perfect high-quality beads available for astronomic prices. Such a massive quantity of ancient perfect beads, even exactly shaped after the buyers taste, is however not possible! The population 2000 years ago was only a fragment of what it is today, and only the richest few of these few could afford to possess high-quality beads. Furthermore, an overwhelming majority of these beads would today only have survived with a lot of wear and tear and in more or less broken condition. So one does not need an academic degree to figure out that almost all of these flawless, high-quality beads must be fake! Today the far east is flooded with new beads looking old. No more ancient beads to get after 2021! Some of my 'spies' in the far East talked with bead dealers from Afghanistan and Pakistan. They said that nowadays it is really tough to find any ancient beads and within three years from now they will all be gone. To mainland China where they will circulate within closed circles of wealthy collectors forming a kind of secret brotherhood, sealed off from the public eye. Here the real stuff will be used as a kind of bitcoins assisting high-end business transactions. DZI is of course the leading bead-coin. High-quality beads will in this setting act as a form of liquid cash much more easy and discrete to transport as compared to cash. Favors can be bestowed, not with vulgar suitcases full of dollars, but with a discrete handshake where a little black stone change hands. As in the case of cryptocurrency, it is difficult for big brother governments to get eyes on these transactions. A further advantage of the beadcoins is that there will not even be a digital trace to follow. Huge wealth can change hands with only these hands knowing. In a situation where not only DZI but all kinds of real ancient beads are getting more and more scarce: What can now satisfy the bead hunger for the significant growing number of wealthy, but not so oligarch type of people in China? These nouveau riche and not so educated layers of the Chinese society are imitating the trends in the upper class, but with lesser economic power, which in the Chinese bead culture is equivalent to Chung DZI, lesser DZI. For sure there are already a lot of genuine ancient beads circulating in the wealthy segments of the Asian societies. There has been a steady flow of real beads into China the last 20 years. There are of course also many serious and knowledgeable Chinese higher middle-class collectors who love beads for the sake of beads. However, seen in comparison to the rapidly growing number of wealthy bead-greedy people with no interest in beads as art or history they play a minor role. Let me here for a brief moment go on a meta-level. There is nothing wrong with this social phenomenon. The story of newly rich people with no brains has been told all over the globe at different times in history. It is an unavoidable phenomenon when a newly wealthy middle class is emerging at a fast pace. As the English say: It takes three generations to make a gentleman. And for sure the new China is 'producing' new gentlemen and woman in an almost singular pace. I was surprised to meet so many super intelligent and cultivated young Chinese people at my last bead exhibition in Bangkok. You can see some of them in the photo above. Here in these 'Tr(i)umphant' times... Let China take over ASAP ... for God's sake! And now back to the theme. In the Chinese bead vacuum, a new wave of high-quality copy beads has replaced the real ones. These fakes have expanded from DZI to almost all other types of beads. Within the last few years even the, for the eastern collectors not so demanded, Indus beads have been falsified on a grander scale. In Bangkok, I also observed Chinese bead dealers purchasing seal beads from the Persian Sassanian culture. They were fake. The sellers knew that. The buyers knew that. However, it was of no importance. This shows that the Chinese interest for ancient beads has expanded into a broader spectrum. Before only beads valued in the Tibetan tradition were in demand. This tendency is not in sync with the usual 'collectors cultural evolution-pattern', where new collectors have a very narrow spectrum of interest and from there evolve into having a global sphere of interest. Only Hong Kong Chinese have evolved organically into this global state. No, the sudden mainland explosion of interest in all types of beads is caused by blind hunger. Beads made far away from Tibet and in entirely different traditions of manufacture and use are on eBay, by facebook-dealers, and other more or less fraudulent bead-websites straight away baptized within the Tibetan terminology to suit the Chinese taste with known spices. Even beads from Africa are now called Chung Dzi and with this name stamped on them, they are quickly passed over the desk. When the hunger is great, you can eat any food, even fake food. In this expansion into a broader spectrum of beads, it gets even more difficult for the collector to spot the fakes. So fake-production and bead-type expansion are linked together. Not too many of the new wealthy collectors have sufficient experience to see if a bead they like is hot or not. Only experienced collectors can tell the difference between these new wave fakes and the rare originals. In Taiwan, they even have TV programs about fake bead production. In such a show a fake-maker showed how he used ancient drills and then placed his beads on a string where they were going endlessly back and forth until the holes looked like being used for generations. The fake-maker even openly said: The Chinese like it this way. As earlier mentioned, even the previously not so demanded Indus beads have popped up in larger and larger quantities of fakes. These replicas are however still relatively easy to spot. Why? Because the prices for Indus beads are still far away from the hyped bead-coin world of DZI. Who bothers about making a sublime fake of a type of bead that will fetch a relatively low price? It is not cheap to make a really perfect imitation bead. Yes - you can tumble the bead in a leather bag as it was done in ancient times. You can drill the hole with ancient copper tools. You can cook the bead in sea salt and then dry it in a dehydrator. So many things are done to make it look ancient. However, it is still challenging to imitate either excavation patina, stupa/burial patina, and patina by wear through 30 generations. Even more difficult it is to mimic ancient scars and cracks. I cannot substantiate following thought. However, you can follow it as a way to widen your perspective. Let's say it will cost 2000 USD to make a high-quality replica bead in a Chinese laboratory that can fool even more experienced collectors. Then the price of such a bead, if it would follow the regular profit rate of the dealers, would be at least 10.000 USD! Through scientific methods, primarily developed in Taiwan, but also mainland China, replicas are getting better and better. This expensive high-end replication is mainly targeting the Chinese DZI-hype. The latest news, according to my 'spies', is that mainland China now has advanced laboratories that can analyze the chemical components of the stone material of the bead. From that chemical analysis, they 'sugar coat' the bead with a perfect looking patina! The next question is now: How come this massive scam can take place apparently without being exposed? Of course pure ignorance plays a great role, but it is also about psychology. It is desire... Too much of desire clouds the mind. The dealers know very well that a huge percentage of their beads are well made new copies. I guess that many of the buyers also deep down know that the bead they purchased is a simulacrum and not the real thing, but they don't want to know. They suppress their suspicion and consciously make an effort to perceive the bead as a real one. This phenomenon, by the way, is the case with all kind of ancient material. How can I know that? I know that because I know this trick of the mind from my self! Many years ago I proudly posted a picture of an 'ancient' bead on the net. A world known expert (with a big ego, but that not the issue in this context) wrote to me that the bead I had posted was a modern fake. Seen with my contemporary knowledge I can for sure say that he was 100% right, but at that time I refused to see the truth and instead I got angry with him. I felt aggression towards the man who had pointed out plain facts! Even today, many years later, I still can observe this tendency in my mind to glorify my beads and put justified doubt aside. However now I somehow can compensate my own natural born foolishness with what I would call meta-consciousness, a loving, but slightly ironic self-awareness that as a GPS correct for the wrong course set by an over dose of greed. Meta-consciousness is by the way cultivated in Meditation. So what can collectors of ancient beads do today? Here I will give some pieces of advice, primarily targeted to collectors from the West, since I am that too. � GET HOLD OF THE SCARRED BEADS! The scarred and not perfect beads are the real ones... The rest is hype created by unconscious greed. In the west we are for sure as 'stupid' as the eastern people, but not on this particular issue: We are not obsessed with absolute perfection when it comes to ancient artifacts. We are not so afraid of wrinkles, cracks, and scars. We even like to feel the energy of beads which has been through a tough time. We adore them as metaphors of heroes of our own culture who got defined through survived battle scars and came out stronger. When I hold an almost too perfect bead in my hand, it is like holding something dead, something which has no essence. Touching, feeling and seeing an ancient and naturally scarred bead, I feel awe. 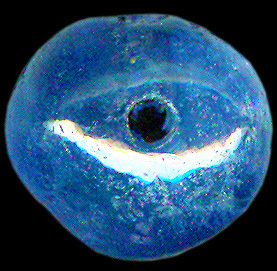 It is almost as this bead is whispering to me through its hole. 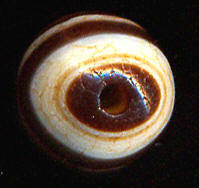 I hear the silk Road stories that this bead has 'heard' at countless caravanserais. 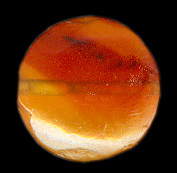 The old bead is a focal point of crossroads of human life. As an antithesis to the contemporary greed, it was a carrier of the belief in something transcendent, something good and righteous. It became hope in what the ancient Indians have termed Satyam, Shivam, Sundaram - The Truth, the Good and the Beauty. I once again return to the ancient and scarred bead in my hand. I imagine one of its wearers being an enlightened Buddhist monk. 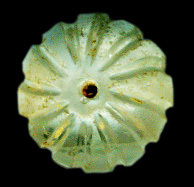 Another bead I look at was maybe used for generations in the same family. 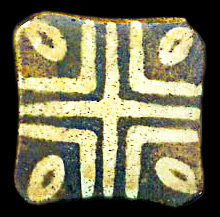 Another bead was found in a tribal chieftains ornament. I imagine it being traded and traveling from owner to owner to all corners of the world until it finally made a more extended stop on Papua New Guinea. And now it is here in my temporary possession. How wonderfully strange are the ways of beads! Yes - I feel the concentrated living history when I hold such tiny beads full of wear and tear in my hand. And I become a living part of this history by the very act of this remembrance. I love the scarred old bead as I love myself for my imperfection. It is a win-win situation to be a caretaker of a scarred bead. It is most probably not a copy since it is not valued in China and... it is full of natural magic. And remember... the bead will survive you... you are just a short event in time and space - you are a bead on the string of a bead timeline. Yes - custodians we are. Don't purchase ancient beads and never DZI unless you are 100% sure about the provenance of the beads! In a bead apocalyptic, not so far away future, exact provenance will be the holy grail. Be extra super careful when you purchase very expensive beads within the hype-field of the Chinese dreams of perfection. Be extra careful with beads without scars and cracks. Just a few years ago there used to be a lot of middlemen between the traditional village bead diggers and the final customers. How and other ever nowadays even a digger who has no access to a standard toilet and other commodities will be in the possession of a smartphone. This has disrupted the bead chain business. The middlemen are increasingly bypassed and the trade is now direct from the Afghan Village to the Chinese customer. Already in the late seventies the French philosopher, Baudrillard coined the term �simulacra�. Baudrillard defines the simulacra as the generation of models of the real without origin or reality. In the modern world of media and internet, man is increasingly removed from contact with the �real world�. He is much more in touch with the signs replicating the real world. In the cyberspace and modern media world, these signs now start to refer to each other instead of referring to real things in the real world. These signs that refer to other signs in a kind of feedback is then starting to simulate reality, a hyper reality. In this way news is referring to incidents in �reality programs� (what an ironic name) in the same way as they report news from Gaza. It is no longer a question of limitation, nor of reduplication, nor even parody. but actually could be described with the old Indian word, Maya, or Matrix if you prefer an updated word. In this plastic fantastic world of simulacra, or should I say silicone, Baudrillard predicts that there will be a growing, desperate longing and need for what is really real. But Baudrillard is a pessimistic man. He saw that only quickly evolving fakes, simulacra, would be given to quench this thirst, with the result that the thirst would be even greater. I must confess that though I agree with Baudrillard's basic philosophy, I am not at all that pessimistic. history and here find �tokens�, symbols of reality that in themselves can emanate 'reality'. Any ancient art object will remind us of the real inside ourselves. 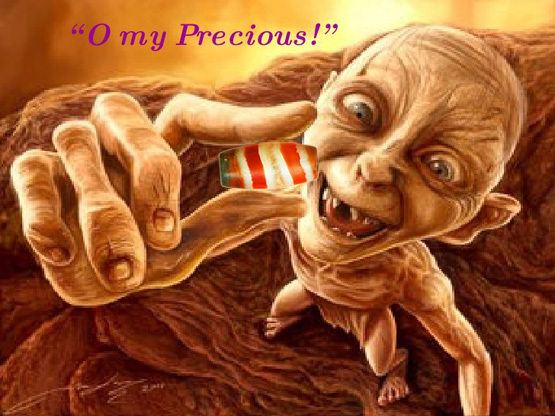 In my case, I get this thirst for the real quenched when I hold an ancient bead in my hand. A genuine ancient bead is a sign and a piece of reality at the same time. 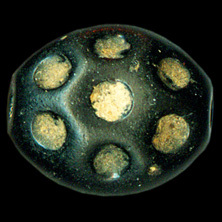 This bead was made more than a thousand years before the world wide web. It was made in a time where time was almost standing still - and only in this kind of time, it is possible to make a bead like this. And after its making, it has become one with human life through symbiosis with sweat from countless generations. Or it has become baptized through the sweat of the earth for millennia. This bead is like a tuning fork. It makes me vibrate with what is real inside myself. can count, is no more distant in eternity than this very instant I am in. All else is simulacra - especially fake beads! Gunnar Muhlman - dedicated to Kevin Ball in honour of his ability to distinguish between the real and the simulacra.